Immediate suspension of disbelief demanded: in Mumbai, a theatre (showing plays not films) with a larger-than-life cut out of the actor, and Broadway style glowing marquee. Where does this mythical theatre exist? Okay, so it has the exterior of Metro and art deco interiors of Liberty, but couldn’t Rohan Sippy have come up with a more believable backdrop for his Nautanki Saala? Just to live up to its title, does the film literally have to set against a modern-day nautanki (theatre) company? Wouldn’t most people recognise the slang origins of the term nautanki saala? A remake of the French film Apres Vous, the plot has a striking similarity to Bheja Fry (also from a French film), in that a man has his life unravelling when he meets a clingy idiot. Ram Parmar (Ayushmann Khurrana) is lead actor and director of a 1500-show hit play Raavanleela (bearing no resemblance to Om Katare’s play of the same title), who lives with his sharp-tongued girlfriend Chitra (Gaelyn Mendonca). 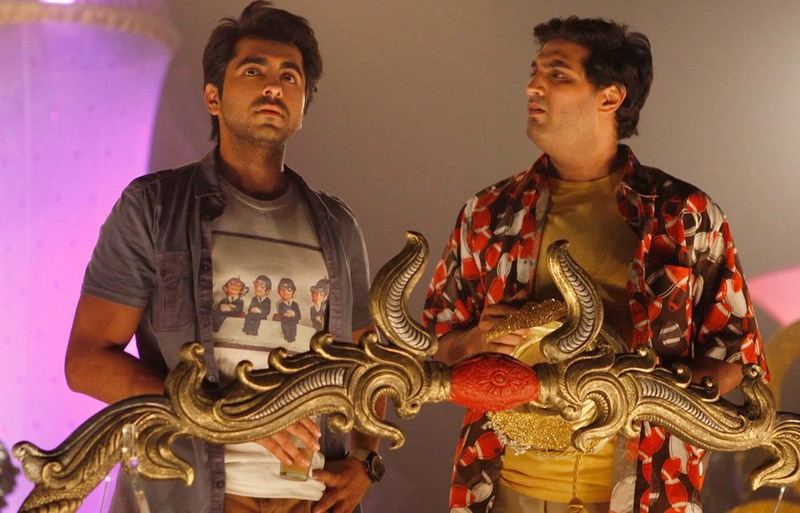 One night he rescues Mandar Lele (Kunaal Roy Kapur) from suicide and can’t shake him off… nor does he seem to want to; rather quickly he refers to the aggravating leech as a BFF (best friend forever). Unlike Bheja Fry, where you feel genuine sympathy for the pathetic and self-important ‘idiot’ and some contempt for the smug corporate type who thinks he is superior, in this film, Mandar is plain despicable, and Ram putting his own relationship and career (hiring the inept bloke for his play) on the line for him, is not just far-fetched, it makes him look like a pushover. With two not very likeable characters running the show, and the female leads bringing nothing to the party but long legs in minis and shorts, there are no sparks of wit flying here. Nandini (Pooja Salvi), the “afraid of being alone” florist was the reason Mandar was attempting suicide, so busybody Ram tries to patch up the broken romance and falls for the girl himself. All his do-gooding lands him at a shrink’s, clutching a stuffed teddy and wearing kiddie bedroom slippers. And serves him right, you’d say! Mildly amusing at best, with too many longueurs for its own good, what works in Nautanki Saala is the music, the well shot South Mumbai locations (making Ballard Pier look like Paris, but what’s with the fake painted view?) and Ayushmann Khurrana carrying his share of the burden, while all the other actors drop theirs.